The Royal Commission into Child Sexual Abuse will be the largest Royal Commission in Australia’s history. It will be focusing on the sexual abuse of children in the institutions that were supposed to care for them. It will put a spotlight on church, secular and state institutions. This website has been established to provide victims and stakeholders with a source of regular news and resources to help them understand the process and have their voices heard. 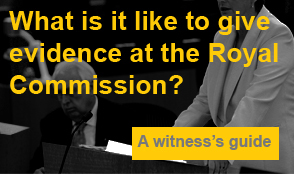 We aim to provide the latest Royal Commission news here and on our Facebook page. Thank you for completing our Claimant Information Sheet. We will review your information and will be in touch. For news and commentary about the Royal Commission into Child Sexual Abuse. This is not the official website for the Royal Commission into Institutional Responses into Child Sexual Abuse. The website is hosted by Peter Kelso, a private solicitor with special interest in victims of abuse. Peter is committed to providing you with the latest news and updates on the activities of the Royal Commission. Peter’s Facebook Page – Royal Commission into Child Sexual Abuse (Unofficial Page) is Australia’s most popular Facebook Page for news and updates on the Royal Commission. Neither Peter Kelso nor Kelso Lawyers are connected to the Royal Commission. Receive email alerts notifying you of the latest news about the Commission.